Dia de los Muertos or Day of the Dead is a day which celebrates the cyclical human experience as a continuum from birth to death, and will be taking place on Tuesday, November 1, 2016 at Salvage Station. Traditionally Dia de los Muertos is practiced by the community receiving the dead as honored guests, departed spirits are awakened from their eternal sleep welcomed amongst their loved ones. 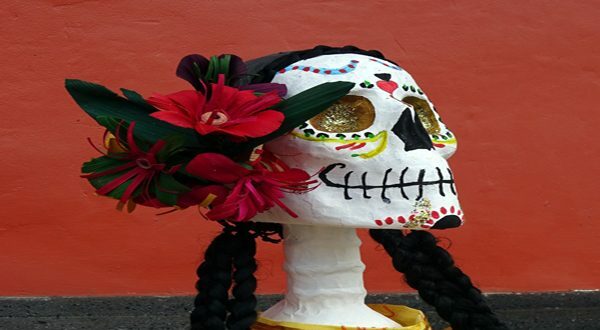 Music, food, colorful, festive and symbolic decorations are elaborately placed throughout the night consisting of skulls, skeletons, marigolds, papel picado and other offerings collected to create altars to honor and celebrate the spirits of past and present. Dia de los Muertos takes place on Tuesday, November 1, 2016 at Salvage Station, located at 468 Riverside Drive, Asheville, NC 28801. Doors open at 5 pm and the event ends at 2 am. Ticket price: $5-$10 suggested donation, kids are free and can be onsite until dark. The evening’s festivities are presented by Fire Jam & EZ Productions. Local live DJ’s will play many different styles of music including House, Drum and Bass, Glitch, Glitch Hop, Psybient, and many more throughout the event on the main stage. Vendors will be lined up throughout the field and include face painting, nail painting, henna, cotton candy, tarot, astrological readings, paintings, jewelry, flow drums, flow toys, and much more! Projections will be done by Murkury, Wobblez Designs, and Vanir Visuals. Flow and fire performances will take place throughout the duration of the event. Live painters will be onsite painting and many more surprises will also take place! Community altars will be made out of offerings brought by the public in attendance and several local artists including Carlos Vera, Sue McQueen, Jennifer Heeder, Nada Jones, and Kati Robbins. The offering should include items that would be appealing and comforting to the returning souls such as flowers, candles, food, photos, and personal mementos of the person being honored. Traditionally it is believed the dead would be insulted by mourning and sadness, festivities must be lively enough to wake both the living and dead. Please join us as we honor the deceased and celebrate their lives together, as a community for Dia de los Muertos on Tuesday, Nov. 1 from 5pm – 2am at Salvage Station located at 468 Riverside Drive, Asheville, NC 28801.